Stevie Silver has been active in the Boston area blues music scene for the past 20 years. Mentored by blues great RONNIE EARL he played with some of Boston's best blues and blues/rock bands. Stevie has had the good fortune to share the stage with some blues artists of renown such as: GUITAR LEGEND RONNIE EARL, GRAMMY NOMINATED ARTIST DUKE ROBILLARD, TAJ MAHAL, JOHNNY WINTER, ROOMFUL OF BLUES, SUGAR RAY AND THE BLUETONES, HARMONICA LEGEND JAMES COTTON AND GUITAR VIRTUOSO ERIC GALES. Striking out on his own in 2007 Stevie started his current group Lil' Stevie and The Westsiders and released his first CD-Can't Get Enough paying tribute to some of his blues influences.Stevie's 2nd CD-Juke Box Baby was released in 2011-Produced by Grammy Nominated Blues Artist Duke Robillard, Stevie released four new and original songs as well as eight covers of wonderful blues artists and has earned glowing praise in the international blues magazine- Blues Music Magazine and had airplay on Sirius XM Radio-B.B. King's Bluesville as well as local Boston area radio stations. He also has had the opportunity to study guitar directly with Ronnie Earl, Duke Robillard, Joe Bonamassa and Steve Lukather of Toto. 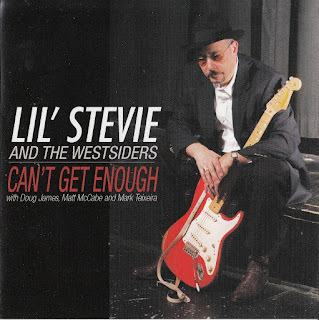 Lil' Stevie and The Westsiders typically performs as a 4 piece blues band (Stevie on guitar and vocals, with bass, drums and keyboards) with the occasional guest horn player. He offers traditional and rockin' blues with emphasis on getting people up and dancing. Stevie always strives to work with the club or whomever hires them to provide the best performance possible. Thanks a lot for all the latest download albums! !